This is a fun item. It is a seven (eight with bonus piece) piece, ready to go, Agility Set for Hamsters, Gerbils, or Mice/Mouse. You could also use this set for training young (small) rats/rat/ratties. 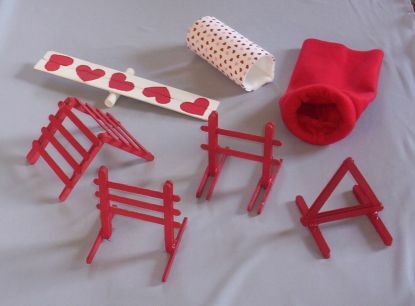 This set include TWO JUMPS, one has three bars and the other has two bars. It has a cute little TRIANGLE HOOP JUMP, and a darling little "A" FRAME!! It also comes with a CLOSED TUNNEL and an OPEN TUNNEL. IT HAS A BONUS TEETER TOTTER WITH CUTE LITTLE HEARTS TO MATCH THE OPEN TUNNEL. This set comes to you in a PLASTIC STORAGE CONTAINER to keep it all together and safe. It is made with wood that is glued together so that there is no set up. It is all ready to go. The Closed Tunnel and Open Tunnel is washable, air dry. The Plastic Storage Container is also washable. You can use it alone or add piece to this set as your sweet pet learns to manipulate the equipment you have set up for it. We have kept price low to further the sport!! PLEASE NOTE: Some of the wood pieces have a warp to them. We have made sure this equipment is safe and stable for the tiny little agility competitors. Check for other color choice in our Agility Equipment catagory of our sales items. This heavier item will ship for a higher flat rate of $5.95 to the USA. Lighter items can be included at no additional shipping costs. Your shopping cart will show your shipping costs and total based on the items in it.